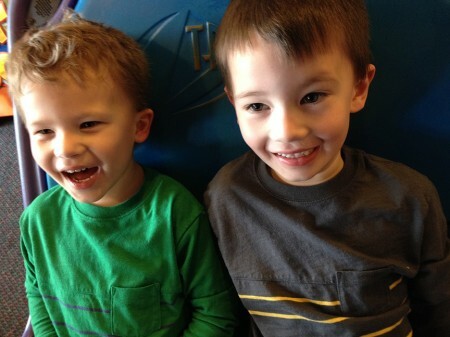 Moving, bouncing, rolling, pushing, kicking…these are all words that I would use to describe my busy boys since before the day that they were born. I never had to sit and count movements when I was pregnant because it was rare that they stopped moving. With two of them in there I could feel and see them moving most of the day and night. I looked forward to my non-stress tests, it was quiet except the sounds of their heart beats. I could relax and think about them and what the future would hold in the coming weeks. They told me that the tests would take 30-60 minutes as the needed to record a certain number of movements to end each test session. I don’t think that I was ever there for longer than 15 minutes. At my 36-week NST both of the boys were still breech with Wyatt’s head lodged in my rib cage and Ruslan’s head pressed against my left side. They never stopped moving and pushing that week. At 37-weeks we went to the hospital early in the morning for an amnio to determine if they would deliver the boys that day. The Dr soon confirmed that both boys had managed to turn over and were head down – I have no idea how they had enough space to mange those acrobatics. 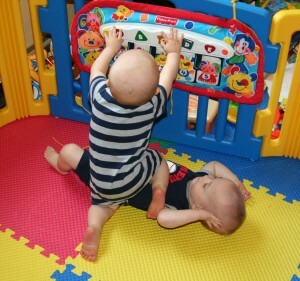 They loved to bounce and swing and rock and push up to look at the world as babies. 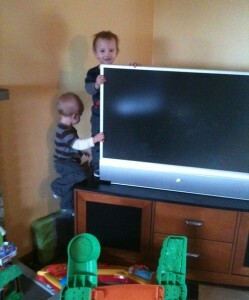 As soon as they could move they got into trouble. As soon as they could get on all fours, they started climbing. 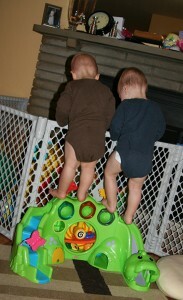 By the time they learned to walk, they were helping each other climb higher by working together. Wrestling, rough housing, running and all manner of complete wild behavior soon kicked in. I started looking through pictures of the wild boys to include and then looked through old blog posts. It’s all fun and games even when you get hit in the head with a shovel – (September 2011) Video of how they interact on a daily basis. They were wild and there were lots of bumps and bruises in those early years, but they could be contained. I could put them in their cribs or inside a gated space. And even during the worst rough housing, they were light-weight enough that they didn’t injure each other too badly even when they stood on top of each other…the better to reach what they wanted. Now that they are 40 pounds, when they run full speed across the room and slam into my legs it stings. When they knock each other over, they fall hard. The jumping is higher, the running is faster, the screaming is louder, the pushing is harder, and when they land there is usually a mix of laughter and tears. The most wild time of day is generally right before bed. That is when they want to jump off the head boards of their beds and knock each other over. Most of all they want to involve me in their rough housing and I generally end up with my glasses knocked off or two boys climbing on me in the process. As I was putting my shoes on one morning this week, Wyatt crouched down and jumped and the top of his head made solid contact with my jaw. I was numb for a moment and Wyatt was holding his hand on the top of his head. I quickly realized that he was ok and I was in a lot of pain. I ended up with a good bruise on my jaw, some swelling and a bad headache for a few days, but I will survive. Yesterday I was helping Ruslan with his coat and he kicked his leg back and forth and made sudden contact with my lower lip. It’s never on purpose, they just don’t stop moving and if you are near, there is potential for danger. They are getting into trouble more often together at school. Yesterday Wyatt told me that he was bad and when I asked him why, he said that he was running in the classroom and had to sit in time out. 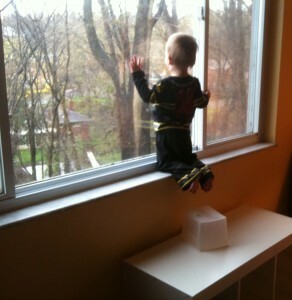 Guess who he was running with and was in time out with him. 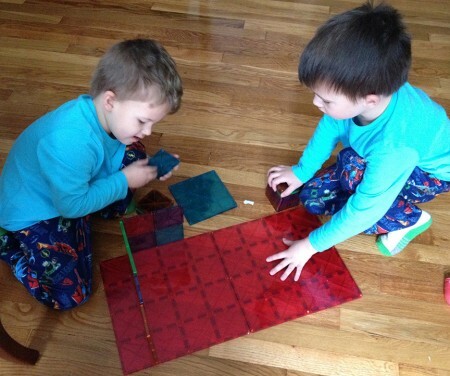 Over the past few months they are spending more time together instead of playing separately. In the course of the weekend, I am often asked “where is my brother?” Sometimes they play nice and sometimes they get into mischief. Fortunately there is more playing together than fighing each other most days. They willingly take turns and share on most occasions. And when they do fight over a toy they quickly make up and get back to the business of having fun.